Pretty much every shampoo manufacturer claims their product makes hair thicker and stronger. But the truth is male pattern hair loss is caused by internal factors that are more than just skin deep. That said, your choice of shampoo can help stop hair loss from progressing by tackling a key symptom: inflammation. In this post we’ll look at what’s widely believed to be the best shampoo for male pattern hair loss: ketoconazole (Nizoral). Ketoconazole is an ingredient used in some shampoos. You might have heard it referred to by the brand name Nizoral. Nizoral and other shampoos containing ketoconazole have antifungal properties, reducing the inflammation associated with androgenetic alopecia (male pattern hair loss). This is true. The current understanding of male pattern hair loss is that the hormone dihydrotestosterone (DHT) binds to hair follicles, causing them to shrink and stop producing hair. But inflammation is also a factor in male pattern hair loss. 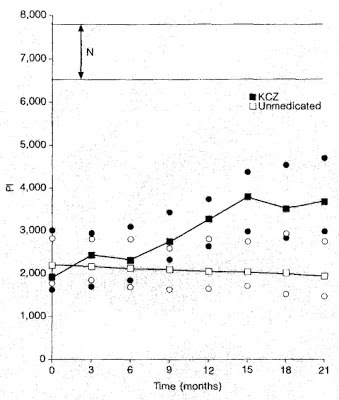 Ketoconazole reduces hair follicle inflammation by reducing microflora on the scalp, in particular the Malassezia fungus. This makes it an effective treatment for dandruff as well as hair loss. As well as tackling this important hair loss factor, there is some evidence to suggest it reduces scalp DHT levels as well. How effective is ketoconazole for hair loss? Various clinical trials – such as this one, this one and this one – have shown ketoconazole shampoo to help with male pattern hair loss. It’s no miracle cure, but it does help – especially when used in conjunction with other proven hair loss treatments. In fact, it’s one of the ‘big three’ hair loss treatments – along with minoxidil and finasteride – that get recommended in online forums as the standard hair loss prevention protocol. One thing I’ve personally noticed from using ketoconazole shampoo is that it pretty much eliminates any sort of scalp itch. As far as I know, there’s no definitive proof of a link between male pattern hair loss and an itchy scalp. But a quick Google search reveals plenty of hair loss sufferers reporting an itchy scalp in balding areas. If I had to guess, I’d say this is a consequence of the inflammation described above. So while it’s only anecdotal evidence, I think this further supports the case for ketoconazole shampoo. If it tackles a symptom of hair loss – itchy scalp – it may very well be tackling the cause too. Either way, it’s worth trying if your scalp is itchy! Other shampoos containing ketoconazole are available! Some ketoconazole shampoos – particularly Nizoral – can be quite harsh. 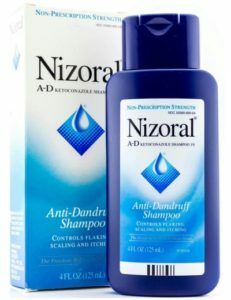 If you use Nizoral every day, it’s likely to severely dry your hair and scalp out. The instructions for Nizoral indicate that it should only be used twice per week, but some people can get away with using it more frequently. Personally, this would absolutely fry my hair. It’s not actually the ketoconazole in Nizoral that dries the hair and scalp out though. This is caused by some of the other ingredients. So if you’re finding Nizoral to be too harsh on your hair, it might be worth trying out an alternative ketoconazole shampoo. These can be hard to find in stores, but are easy enough to find online (see the list above). I’ve been using Regenepure DR (which contains 1% ketoconazole) every other day for over a year and it doesn’t dry my hair out at all. But each person’s hair is different. In general, ketoconazole shampoos are very well tolerated, with minimal side effects. By far the most common negative side effect is the one described above: dry scalp. If this occurs, try using ketoconazole shampoo less frequently, or switch to a different brand. More serious side effects can occur when ketoconazole is ingested orally. But unless you’re drinking your shampoo, I wouldn’t worry about it! It’s no miracle cure, but ketoconazole shampoo is an effective weapon in the fight against hair loss. There are many shampoos which claim to prevent male pattern hair loss, but ketoconazole is by far the most effective. It reduces inflammation, stops your scalp from itching, and may even reduce DHT levels in the scalp as well. There’s a reason why it’s one of the ‘big three’ hair loss treatments: it works. But if you’re suffering from male pattern baldness, don’t expect it to stop hair loss completely. Ketoconazole shampoo is best used in conjunction with other proven hair loss treatments. Previous post: Has TYGA had a Hair Transplant? Next post: 10% Minoxidil vs 5%: Which is Best for Hair Regrowth?